I had to wait a whole year for this book. When it finally came out I read it from cover to cover in one sitting and I’ve read it many more times since. 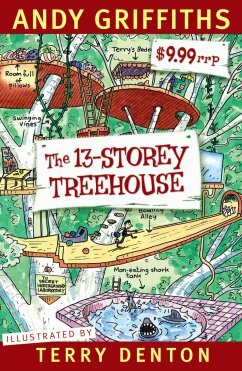 This is the fourth book in the Treehouse series and once again 13 new storeys have been added, including a watermelon smashing room. But Andy and Terry soon remember something important — Mr Big Nose has forgotten to remind them about the deadline for the new book and he has gone missing. Could it be related to that book Fun with Vegetables by Vegetable Patty? They take off on an advegetable story (an adventure with vegetables) with the help of a little caterpillar with a surprising secret. And what has happened to Jill? Why won’t she wake up when Andy and Terry explode in? I liked lots of things about this book. Firstly, the unexpected plot. My little sister kept wrongly guessing the next step of the plot. I liked the characters — some minor characters from earlier Treehouse books are back, and there are some new ones as well. My favourite part was the craziness of everything in the book, especially Terry’s ninja snails. My special tip for reading this book is that you should read the other books in the series (like The 26-Storey Treehouse) first because then the jokes are funnier and they make more sense. The illustrations in this book are by Terry Denton (like in the earlier books). They are just perfect for the Treehouse series because there are lots and lots of them and they’re the sort that you don’t get bored with. His drawings are like first drafts, it’s like you’re seeing them when he’s just finished drawing them. I like that. I would recommend this book for 7 to 13 year olds and all adults who like a bit of humour. My special warning: if you’re scared of spiders, skip over Terry’s spider pictures — they are pretty scary. Both boys and girls will enjoy reading this book. I rate this book 9.5/10 and it’s my favourite book in the series. Joseph is one of our regular book reviewers. His most recent review (if you don’t count this one) was of Our Village in the Sky. If YOU would like to send us a book review, check out our submission guidelines. Happy reading! This is the third book in the series and there are 13 more levels than in the previous book. I wanted to know what storeys they had added and I thought some were very clever like the not-very-merry-go-round. My favourite storey would be the Top Secret Not-Yet-Finished one and I thought the name of the machine on that level was great but I’m not going to tell you what it is because it’s better to get a surprise. It was worth the waiting — this book is just as funny and interesting as the first two, though I still think that The 26-Storey Treehouse is my favourite because I really liked the new storeys they added in that book. The illustrations in this book made me laugh out loud and I really like the colour maps inside the covers of all the Treehouse books that give you a cool look at the new storeys each time. 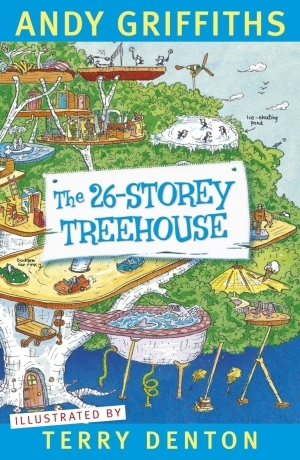 I can’t wait till The 52-Storey Treehouse comes out in September 2014 to see what the new storeys will be. Now I’ve finished it, I’d better rush this book to the library so the next kid on the waiting list can enjoy it too. 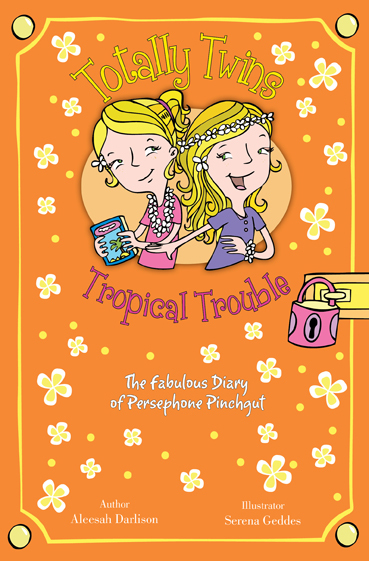 I would recommend the Treehouse books to kids aged 6 to 12 and cheeky grownups too. I rate it 9/10. Joseph is one of our Junior Book Reviewers. Here are two of his other book reviews: The Nelly Gang, and Maximum Maxx. If YOU would like to send us a book review, check out our submission guidelines. Happy reading! 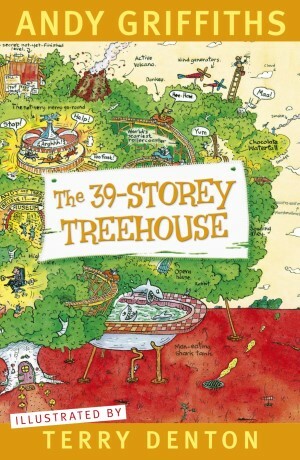 Have you read The 13-Storey Treehouse? Well, Andy and Terry are back with another 13 new storeys! When Andy tries to tell us a story, he is rudely interrupted by Terry, who’s apparently made the sharks sick by feeding them his underwear. Then Jill comes and helps. Inside one of the shark’s bellies, Andy finds a wooden head that belongs to Captain Woodenhead. This leads into the story of pirates with Jill, Andy and Terry. Then a real pirate ship pulls up at their shore, and out comes a captain with a disgusting head. Apparently he found it in a fish’s tummy. Could this possibly be Captain Woodenhead, and if so, how will Andy and Terry shoo away the captain and his crew? I liked this book, however — it was quite gruesome and this book would suit pirate lovers better. I would give this book a rating of 7/10. Celine is one of our Junior Book Reviewers. Here are two other books reviewed by Celine on Soup Blog: Blood Brothers, and Rotters and Squatters. If YOU would like to send us a book review, check out our submission guidelines. Happy reading! All through October, Alphabet Soup is celebrating turning three. 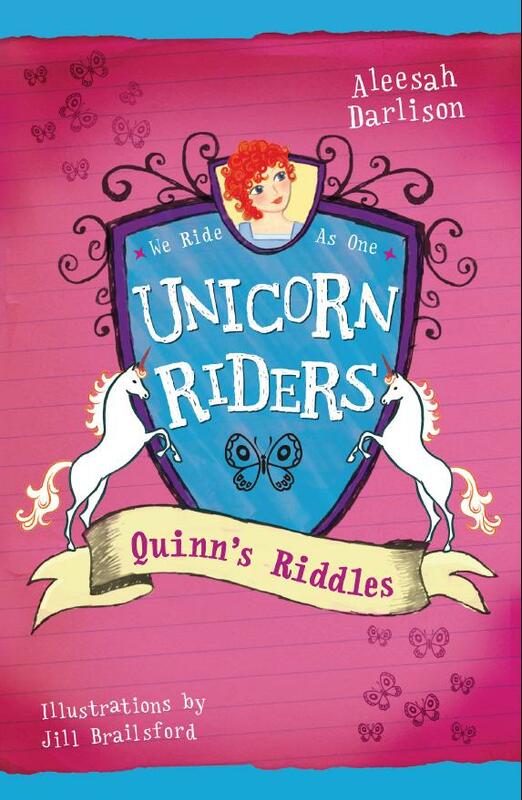 We have heaps of writers and illustrators stopping by to answer THREE QUICK QUESTIONS and today’s visitor is Aleesah Darlison, author of many books including the Totally Twins series and new series, Unicorn Riders. I usually write in my study where it’s quiet and cosy and where I can display photos, posters and props, etc about what I’m writing about. A book I read recently—The 13-Storey Treehouse by Andy Griffiths. Very funny. 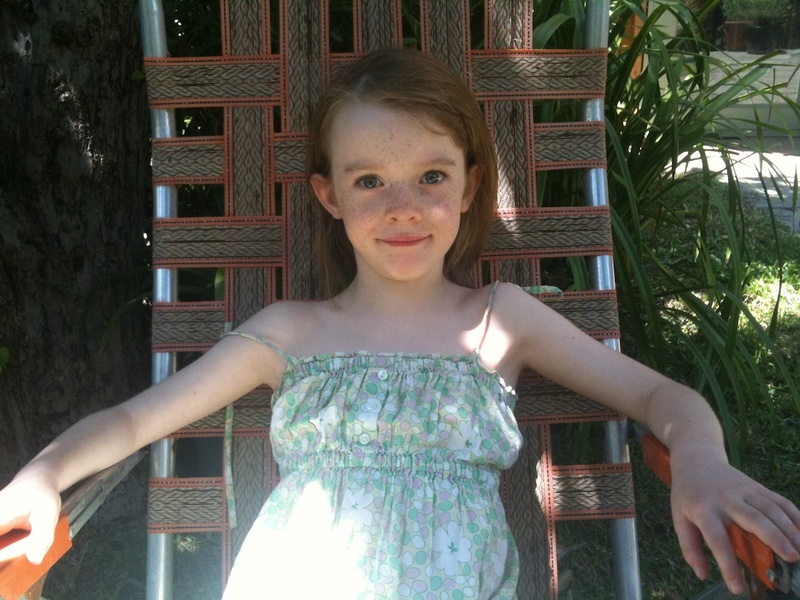 Find out more about Aleesah Darlison and her books—visit her website.